There are familiar names on the two main trophies at this year's Sydney Royal Beer & Cider Show. The medalists and trophy winners were announced last night (19/9/2014) and saw Sydney's Redoak follow up last week's Supreme Champion Beer title at the International Beer Challenge in London with Champion Bottled Beer, with trophies awarded to the same beer, the spontaneously fermented Château Sour. Champion Draught Beer went to WA's Mash Brewing for its American amber ale Russell. Back in May, Mash's Copy Cat American IPA was named Champion Australian Beer at the Australian International Beer Awards; in Sydney, it was awarded a silver. For the first time, cider was included with the Champion Cider title going to The Barossa Valley Cider Company's Squashed Apple Cider, an authentic tank fermented cider made from a blend of South Australian apples. The awards received a record number of beer entries - 152 - and also handed out a record number of golds and silver medals. Alongside the Château Sour and Russell, golds were also awarded to Nail Brewing's Hughe Dunn Imperial Brown Ale and recently released Red Ale, to Black Duck's Phoenix Migration Stout, and Macarthur Grange's Stockade Pale and Stockade Rebel Ale (brewed at BrewPack). Medals were awarded by judging beers to strict style guidelines, with the six golds in the bottled categories then tasted blind again by the judges to decide which was the best overall. Chief Judge Neal Cameron, head brewer at the Australian Brewery was deeply impressed with the quality of brews, saying it was a sign of the continued drive for excellence in the Australian industry. 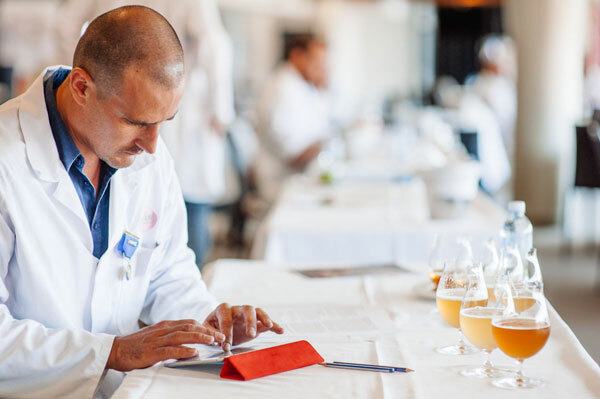 “The highlight of the competition was the superb quality of beers presented by the Australian brewing industry," he said. “The Champion Draught Beer was a clear winner and well deserved. In the bottled beer category however, an extraordinary six gold medals were judged to find the champion; each and every beer was outstanding and it proved almost impossible to distinguish between the top few beers. He was joined by fellow judges Ian Kingham (ALH), Shawn Sherlock (Murray's), Tina Panoutsos (CUB) and Karina Dambergs (Dickens Cider).